John Schad is Professor of Modern Literature at University of Lancaster. His most recent book, Someone Called Derrida (2007), is a real-life detective narrative centred on Jacques Derrida’s secret Oxford life. His novel, Nowhere Near London. Or, I Am Not Walter Benjamin, comes out in 2011. Oliver Tearle is currently completing a doctoral thesis on hallucination in weird fiction at Loughborough University. He has written for (among others) Notes and Queries, Critical Sense, and the Modern Language Review. His first book, The Curtained Room, will be published by Sussex Academic Press. Well this is it: the end, last gasp, final straw; in short, the concluding dark volume in a series of books some idiot called ‘critical inventions.’ Let us be like wry Oscar Wilde, said the idiot, and dream of the critic as artist, or at least as someone else, as someone other than who we had thought he was, or been taught he was. Let us, continued the idiot, set the critical dogs off the leash and see what they come back with. And here they are: no less than twenty-four press-ganged souls all huddled together for warmth; some are critics, some are poets, and some are critic-poets; among them such as Steven Connor, Jonathan Dollimore, Ewan Fernie, Mark Ford, Kevin Hart, Geoffrey Hartman, Esther Leslie, Willy Maley, and Michael Simmons Roberts. So, twenty-four voices, twenty-four shots in the dark, or maybe shots at the dark, or possibly the head, or even the foot. But whatever, each is a shot at pushing the battered perambulator of dear old criticism so far and so fast that someone somewhere – whether in anger, derision, or pain – might just cry ‘Crritic!,’ that curse of all curses, the best of all possible anathema. 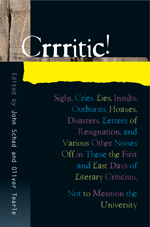 But maybe, just maybe, the exclamation ‘Crritic!’ will here double as a cri de coeur, or howl of self-loathing, or scream of delight, or laugh in the night, or just a smashed-up and beaten old prayer. We shall see. Wow! What can one say more? After this book, academic “discourse” (note the “scared quotes”) in all its genres, not to speak of poetry, and not to speak of the distinction between creator and crritic, will never be the same again. This book fulfills, and then some, the project of John Schad’s series, “Critical Inventions”: “. . . this series seeks the truly critical critic – or, to be paradoxical, the critic as critic; the critic who is a critic of criticism as conventionally understood, or misunderstood. He or she is the critic who will dare to disturb the universe, or at least the university - in particular, the institutionalisation of criticism that is professional, university English.” The twenty-four critical creations gathered here are almost all by Britishers, two by European-born immigrants to the United States, one by an Australian. These include poems that are critical essays; autobiographies that are really critiques of the British institutionalization of literary study; critical essays that flaunt the established conventions of such essays, et cetera. The law of genre is shamelessly defied. Allusions overt and covert abound, as if to indicate that the flotsam and jetsam of the Western literary tradition is floating around the minds of these writers in strange juxtapositions, testifying, it may be, to the not entirely predictable result of much academic literary study. Perhaps the most devastating effect of this collection is to make the reader, this reader at least, feel that everything he has ever written has been unconscious parody. Read, but read at your peril. Caveat lector.